Karen Jackson-Weaver is the Associate Dean of Academic Affairs and Diversity at Princeton University's Graduate School. She specializes in American religious history, with a focus on black women's leadership roles in sacred contexts. 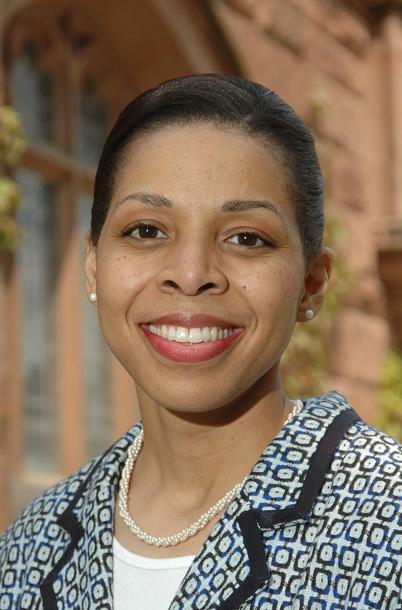 Jackson-Weaver has been a Fellow at the Institute for Research in African-American Studies at Columbia University, a faculty member at the Institute of Youth Ministry at Princeton Theological Seminary, and a Visiting Scholar at the King Center Library and Archives in Atlanta, GA. Jackson-Weaver earned her BA degree from Princeton University and a Master's degree from Harvard University. She holds a PhD in American history from Columbia University, where she was a Kluge Scholar Fellow, Dean's Dissertation winner, and nominee for the university-wide teaching award. RSN: How do you see teaching and scholarship as related? Jackson-Weaver: I have always thought that teaching is a natural outgrowth of one's scholarship. In many ways, our scholarship and our teaching are organically connected and it creates an exclusive occasion to form a substantive link between theory and practice. One of the reasons why I am excited about being the series editor of the Teaching Religion Series is because we have a unique opportunity to create a meaningful intellectual forum for religious scholars and theologians. I also think it is important to emphasize that this series creates a real opportunity to obtain professional development. It truly seeks to foster an understanding of the methodological and pedagogical framework with a number of topics. My hope is that our readers will see the extraordinary connections between teaching and scholarship, rather than envisioning this as a process of remediation. What this means is that we will be very deliberate about establishing a foundation which is centered on scholarly excellence and scholarly inquiry. This will allow us to really grapple with how to leverage our encounters with teaching in the most imaginative and innovative ways. RSN: What are your goals for the Teaching Religions book series? 3) To address the most relevant topics and themes in religion and theology so that we are able to produce bodies of meaningful scholarly work, which will make a major impact upon the field. This series is designed to be a significant resource for those who are new to the field, as well as those who are well-established scholars. RSN: What kind of submissions will you be seeking and what are important topics for future volumes? Jackson-Weaver: There are a number of topics that I would like to see in future volumes. One of the most important topics I would like to address concerns women in religion. I am really interested in interrogating women's roles in sacred contexts. How do we explain the role women play in broad theological contexts? We really need to wrestle with the gender dynamics we see in many of the sub-fields in religion and create a framework of how one should consider presenting this rich material in a seminar or classroom setting. How do we reconcile the "stained glass ceiling" in sociohistorical contexts and what are the implications of this as it relates to gender, class, race, and socioeconomic status? I would also like to see us compile a volume on "Politics, Religion, and Popular Culture." The public sphere versus the private sphere, and how we understand the meaning and uses of religion — that intrigues me. I'd like for us to explore the connections and intersectionality with policy issues, religion, and culture, and how one makes sense of the various moral, philosophical, and religious perspectives that exist. I would love to receive submissions for a volume which tease out some of the contemporary challenges we face. How do we teach courses and seminars which highlight our moral, ethical, theological, and religious differences and make sense of the very real contemporary challenges we face as a society? In this regard, I am also hopeful that we can put together a volume on the "Theology of Dr. Martin Luther King Jr." I had a unique opportunity to meet Mrs. Coretta Scott King during my post as a Visting Scholar at the King Center Library and Archives shortly before her untimely death. I think that she, along with so many others, influenced how Dr. King articulated what it meant to strive to create a "beloved community." Mrs. King committed her life to non-violence, human rights, social justice, and the remembrance of Dr. King's legacy. How then do we understand and make sense of the vestiges of racism, sexism, and classism? How do we address other forms of oppression and prejudice that manifest themselves in sacred contexts and theological spaces of inquiry? I am hopeful that this series will create a forum for us to tackle these and other relevant issues. I look forward to leading this effort and producing a body of work that I am confident will have a significant impact on students and scholars. For more information about this series and our other book series, visit the AAR website at http://www.aarweb.org/Publications/Books. AAR book series are published by Oxford University Press.